create a stable structure using stapler, screw driver, and rubik cube. you can use any number of above objects as required. You are sitting at the rear end of a theatre. there is a dance show going on the stage. draw what you see. design an interesting mural using the planetary shapes. color it with 5 unique colors. create a sculpture for architecture school. you are an ant walking through a pile of vegitables. draw what you see. 1. 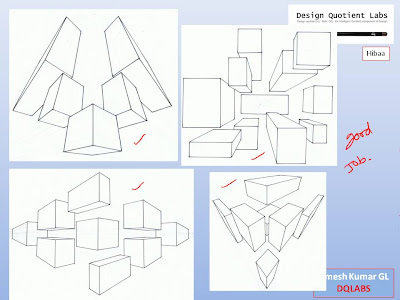 Redo your first 3d composition question. implement all the concepts you have learnt so far. 2. create a logo for a primary school and color it using 3 different colors. 3. design a border for a saree using triangles and circles. color it with 5 interesting colors. excellent job. 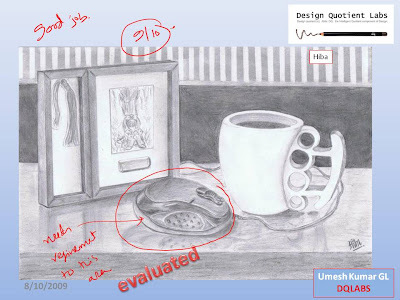 DAY 11 create a still life drawing of a cofee mug, computer mouse and a photo frame. Day 10 assignment sent to yuor mail. i have sent you couple of themes. assume a sunlight position and give shades, shadows and texture to the scenes. i have sent you some assignments on shading. please submit them. draw the exterior views also given in the previous asignments. Good Job. Submit day 7 sketches. Good Job. Submit day 4 sketches. surface quality of an object is called texture. it is either visual or physical. for example - tree bark has rough texture. slik cloth has smooth texture...etc. However, an object might look rough, but actually it might have a smooth feel when you touch it and vice versa. you need to represent this in your sketching. Submit day 2 sketches sent to you. if you are unable to submit the sketches within time take a day or more. but do the assignments to your fullest potential. If i wanted to draw a sphere in birds eye or worms eye view, how should i do it... should i alter the shape or will it be the same spherical shape? Enclose the sphere in a cube. draw the cube in required perspective nad then fit in a the 3d shape in it. a spherical ball in ants / birds eye view looks distorted. it would not look spherical. it looks like an egg. What do you mean by aesthetic sensitivity? ones ability to make out if a peice of art / object is good looking or not as per the prevailing trends or preference. Are we allowed to draw margins on our paper? yes you can, if it enhances your sketch why not? okay, why are mechanical pencils not allowed??? I dint read the saree question properly , i thought it was a saree pattern, sorry.